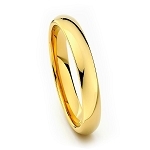 Timeless Classic Gold Tungsten Ring. 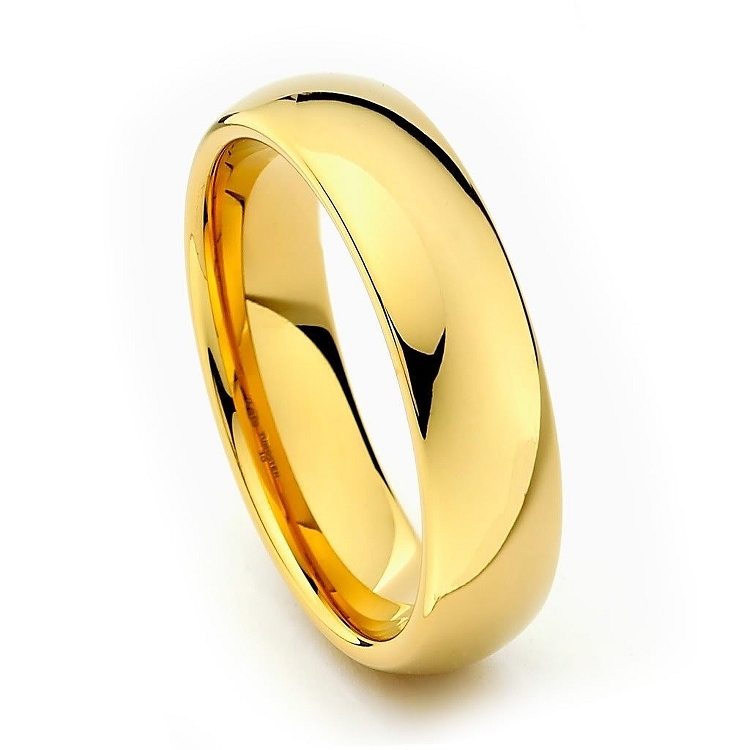 This 6mm Gold plated Tungsten Ring will never ship, scratch, tarnish or peel. Q: the pic. has a black streak on it , or is it all gold color ? will the gold color scratch easy or wear off ? Q: Is this 18k gold? Was this answer helpful? 13 of 16 Customer(s) found this Answer helpful. Q: I understand why the tungsten carbide alloy is scratch proof...but 18 k gold plating is very soft. How can the gold plating also be scratch proof and wear resistant? Q: Is Id Style 5000 also tungsten carbide? The description says "Gold Classic Tungsten Ring 6mm" only. Q: Is this a "comfort fit" ring? Comfort fit rings have a rounded interior for a more comfortable fit, as opposed to the flat interior of standard fit rings. Yes it is. All the rings we sell are 'comfort fit' - if you need anything else, let us know! Q: Do ring sizes run large or small or are they an exact fit? A: Our ring sizes are an exact fit. If you need anything at all, please let us know! Q: Will the gold plating eventually wear off? If so, about how long will the plating last? Q: What if it is the wrong size when I get it. (Too small or too large)? A: Hi Bill! If the ring is too big or too small, you can exchange it at no cost. We ship the ring with an exchange form. Just make sure the ring is not engraved. Hope this helps! Q: is there any gold content in this ring, and is it carbide? Q: engraving on inside of ring? Q: With this ring.....is it 18 kt? 14 lkt? Is it solid gold? or just plated? Is any part of it tungsten? 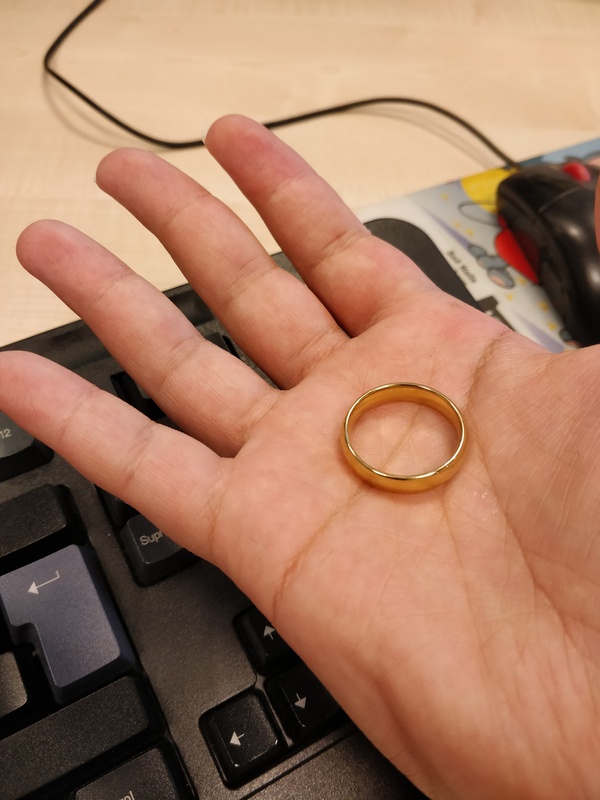 I bought the 5000 style golden ring which looks great and feels great. I changed the size easily with no hassle. This company respects and satisfies every customer;definitely I will shop from them many times since I am happy with their deals and their high standards. I recommend this site to my favorite people. Great looking ring!! Been doing rough work with my hands and ring still has a perfect finish on it!! Would definitely recommend this ring if you are looking for a durable ring that doesn't appear to tarnish or scratch!! Great product, I will be ordering my wife one to wear while traveling and keep her wedding band in my safe. Super fast shipping!! The ring fit perfectly. Will buy again!! My fiance and I got this for his wedding band since our budget is tight. The ring is beautiful! Great weight and size. I got it engraved. The engraving is a little hard to see but that is OK. 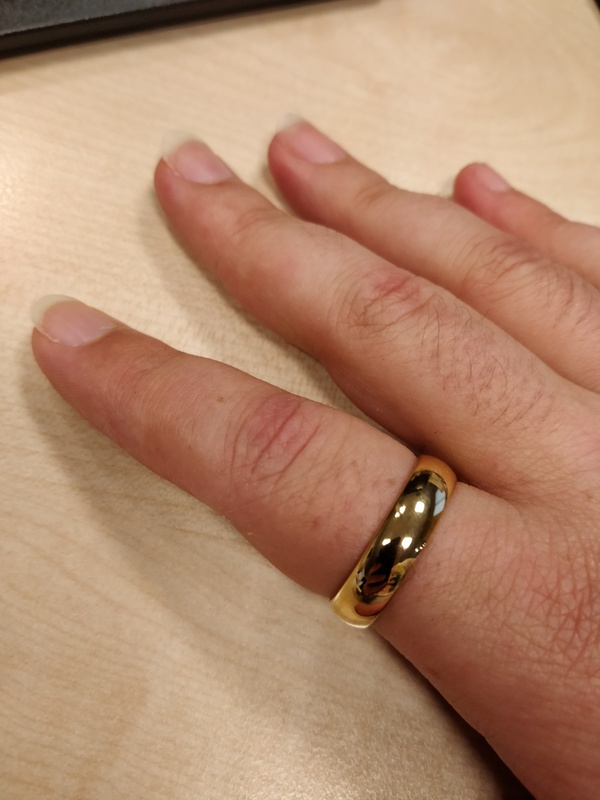 Happy with this ring: Gold classic tungsten ring 6mm. This is my 3rd ring and absolutely love these rings. So comfortable and the gold is definitely holding up, no scratches and still shines. Great purchase. Love the 6mm gold wedding band. Damien was great to work with. I would recommend this site to everyone. I bought rings for me and my husband - they are absolutely beautiful, and we are very happy with them. Incredible customer service, speed of free shipping, chat option pleasant, and I called, and the phone was answered by a real live American human being!! WOW! Very refreshing!! Delivered quickly. I am extremely pleased with the ring. I have lost two gold rings (total value exceeding ~ $1000). I purchased this ring because I could not stand losing another $500 ring. I only wish I was aware of it as an option before (maybe it wasn't). The reason I lost my previous rings is because I had to scrub in on surgical procedures during which I felt it inappropriate to wear a ring (and they were removed/stolen from the pants I changed out of into surgical scrubs). Awesome ring better than his original one. This ring is literally gorgeous. It’s perfect. My boyfriend absolutely loves it. This website is also very good with their customers, I would recommend to my friends and I would definitely shop here again. I purchased this ring to keep my original wedding ring in place as it was always slipping off my finger and couldn't be resized. I've always worn another ring for that purpose and they would get scratched up. This ring is beautiful and so comfortable to wear. This is great replacement for my 14k gold wedding band as I have ruined 3 rings in the last 23 yrs. This is the second ring i have bought If you're looking for a good deal and great value this is the place. The ring looks great. I mistakenly ordered the wrong size. I returned the ring for the correction without any hassle or problems. I have recommended this company to family and would for anyone else. Beautiful ring I bought 2!!!! Very attractive and elegant ring with best affordable price.